Fira backpackers place i Santorini, Grækenland: Reservér nu! first night cancellation fee after the confirmation of the booking until 21 days before the arrival date and less than 21 days before arrival date or not show full payment of the booking. 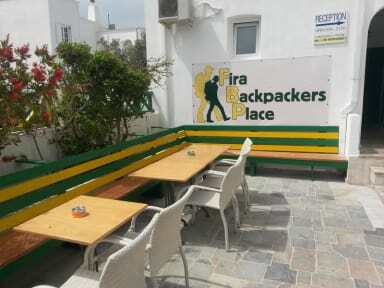 Fira backpackers is a budget new place with private rooms and dorms at the down town area of Fira the capital of Santorini island. We are here to provide you a cheap accommodation stylish place with all the facilities of a hotel. Less than 100 meters (1-2 minutes walk) from our door is anything you need for make your holidays at Santorini easy as the main bus station of Santorini , the main square of Fira town , the Caldera cliffs for shopping and sunset views, banks ,travel agencies , museums, bars/clubs, restaurants, hospital and supermarket. All private rooms have a bath, balcony, fridge and air-conditioning. The private rooms are cleaned daily , new towels every second day and new sheets every third day. All dorm rooms has a bath, luggage lockers ,air condition and fridge. The dorm rooms are cleaned daily ,new towels and sheets every third day. We offer to our guests for free: Wi-Fi ,to use a kitchen, the use of a washing machine, internet corner,daily cleaning service in private rooms and dorms, 24 hours hot water, living room with big screen for sports and movies,hair dryer ,iron and board. We also can arrange you private or shared transfers, car and motor rentals, tours around the island and our unique volcano! We can offer you all info for what to see and where to go upon arrival at our place, all tour information with the best prices from anywhere else as our prices is for young and budget travelers and a free map of the island. We are here to make for you Santorini island a budget destination with the less you pay the most you get. after that you can not change or modify your booking & the full amount have to be paid at your arrival time at our hostel. If your arrival time at our place is after 9:00 pm please contact us the day before for make us to know the time for be someone at our reception to make you check in. I absolutely loved this very cosy and welcomming hostel. Everyone was really nice and helpful. A real backpackerplace and everything you need within walking distance. Definatly recommends! And if you keep an open mind and positive attitude, you get to meet the Best people from all over the world. Great location, friendly and helpful staff, the dorm was a bit cramped and tight and toilets very not super clean. But good value for money in Santorini.